I am proud to be supporting the Out of the Blue race on Thursday 12th May at Ashburnham Place by sporting one of these lovely boards sponsored by Wyatt Hughes. I'm also running the 5k race on the evening of Thursday 12th May - how great would it be if loads of the Walk2Run Tuesday and Saturday groups came along? It's a super-friendly race in a beautiful setting. Let me know if you're interested in running or just coming along to watch and cheer. Both are needed! 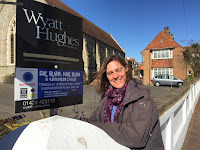 “In the immediate aftermath of Will’s death, our family was supported, guided and inspired by three charities – Winston’s Wish, Dragonflies and The Beachy Head Chaplaincy Team. Out Of The Blue raises money to support these charities so they can help others like us. Winston’s Wish provided invaluable advice in the first few days after Will’s death on how to explain the death to our young sons – Tom and Joe. All of Will’s family have benefitted from the information and booklets provided by Winston’s Wish. We feel incredibly grateful to them for their practical advice and compassionate support. Their specific knowledge of dealing with suicide and other violent deaths has been incredibly important for us. They continue to provide counselling to the boys and me - with great compassion and expertise. Dragonflies, our local child bereavement charity, have shown great support to the family. Tom and Joe have attended support group sessions and an activity weekend alongside other bereaved children. In a group setting the boys have talked about their dad. They have been able to realise that they are not alone in their grief and that they are able to recognise and accept their different emotions. Beachy Head Chaplaincy Team The third charity we support is the Beachy Head Chaplaincy Team. Not only did they support a group of us when our search for Will ended at Beachy Head on that January day, but the work they do is truly humbling when it comes to human duty. We have witnessed first hand the work they do to encourage desperate and broken individuals not to end their lives. The service is staffed by volunteers and relies on donations to help them provide the service they do. Come and run with me, it might just save a life. Proud to be part of it... amazing stuff you guys are doing.